Popular Lagos cinema house Ozone cinemas, recently became the centre of attraction for many movie lovers as it premiered the blockbuster Hollywood film Cowboys and Aliens on the 25th of August 2011. The movie which was premiered before a large audience that included top celebrities like Nomoreloss and one part of the famous gospel duo Rooftop Mc’s, started with a red carpet that began at 6.30pm where fans revealed their high expectations for the movie. The movie premiere then started 7.30pm. 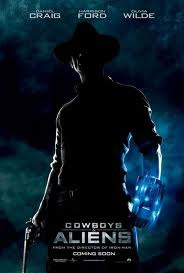 Cowboys and Aliens was revealed to be a mixture of action, suspense and humor, and kept the fans engrossed trough out the duration of the movie. Speaking on why the cinema decided to premier the movie the cinema manager of Ozone cinemas Mr. Ebosiem Brown said, we decided to give movie lovers a treat, the movie Cowboys and Aliens is a big hit and a lot of people have been expecting it, so we decided to deliver it to them in grand style and in a way that would make them leave here with a memorable experience. The movie Cowboys and Aliens which stars top Hollywood actors like Daniel Craig, Harrison Ford and Olivia Wilde is about the story of a man Jake (Daniel Craig) who wakes up in the desert with no recollection of who he is, what happened to him and how he got there only to discover he has a strange object attached to his wrist. He therefore begins a journey to find out who he is and what this object on his hand is. Cowboy and Aliens has since its premiere been showing at Ozone Cinemas.